One of the few items pointing to progressive transportation policies in Baltimore are the growing numbers of dedicated bus lanes, often painted in bright red. Problem is, bus lanes don't have much effect on transit if everyone else thinks that they are a perfect way to bypass a backup. Like many other traffic laws in Baltimore, there isn't much enforcement and lane restrictions are broken with impunity. Where going straight through a red light is common, driving on a red bus lane seems just a very small infraction. 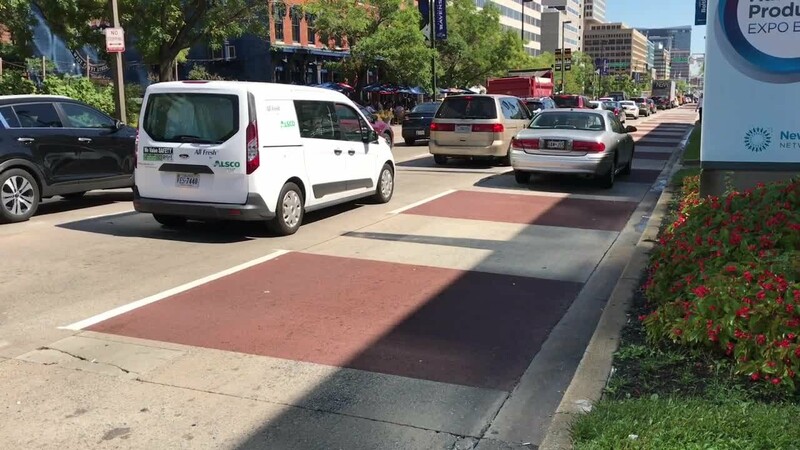 To combat this Baltimore already increased the fines for bus lane infractions and illegal parking in bus-stops when observed by law enforcement officers. This caused a flap when, even after the new fines became law, it took the City several months to code the new fines in their ticketing system. 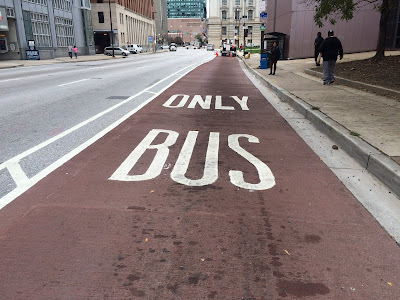 Bus lanes in Baltimore: How to enforce? To combat illegal driving on bus lanes more effectively, Delegate Robbyn Lewis submitted a bill with with Delegates Angela Angel and Brooke Lierman as co-sponsors. The bill is titled House Bill 749, An Act concerning vehicle laws - Bus Lane Monitoring Cameras - Authorization. The bill aims to take advantage of the fact that each transit bus has a forward aiming camera installed, one of about a dozen on-board cameras, which films everything happening in front of the bus in real time, including bus lane violations. To use these cameras to pursue traffic violations requires an enabling and authorization law. As usual, Baltimore is not on the vanguard of neither bus lanes nor the question of enforcement. This has the advantage that legislators can learn from other jurisdictions who use bus cameras for enforcement. Two such cities are New York and San Francisco according to a study commissioned by the National Capital Regional Transportation Planning Board (TPB) in coordination with WMATA. The study was completed last year and has contributions from Baltimore's local brnach of Kittelson Associates. While the Baltimore Delegates were not aware of this particular study, they prudently circulated their draft bill to MTA for comment before officially introducing it last week. While it seems simple enough to allow buses to photograph or film violators, the devil is in the detail. Any automated camera enforcement is not seen as a moving violation in Maryland and is pursued in the same way as a parking ticket. While an officer stopping a violator pursues the actual driver, automated enforcement pursues the vehicle's owner since cameras are not allowed to positively identify drivers as a matter of privacy laws. This immediately lowers the fines from the $250 level of the City fine catalog to a maximum of $75. The MTA wants to get drivers off the bus lanes for sure, but isn't interested in a lot of additional cost to do so. Bus camera footage gets downloaded when the bus pulls into the depot after a day's runs, but how to distill the moments of violation captured on hours of footage? In San Francisco "human officers" review the footage and issue the citations. The process poses similar problems as the ones with the red light cameras: Those "human officers" can easily be overwhelmed by the tedious task and issue mistaken tickets, for example to drivers that were legitimately on the lane. There are a good number of possibilities how one can be rightly on a bus lane: Near intersections where the right turn lane is shared with teh bus lane or in cases where the bus lane runs parallel to a parking lane and cars have to pull in and out across the bus lanes. A precedent for use of bus cameras to enforce traffic laws has already been set in Maryland with school buses which film traffic while they are stopped with red flashing lights and cars are not allowed to pass. Frederick, Montgomery, Prince George’s, Washington and Montgomery counties currently use school bus cameras to fine violating drivers. The MTA has employed a number of strategies to make their buses run faster and more reliable, including traffic signal priority, shorter routes and deicated lanes. The agnency reports that bus speeds have significantly increased after the bus only lanes were introduced on routes such as Pratt Street. In the end it all comes down to cost and benefit. The aforementioned study provides an a Benefits-Cost Analysis (BCA) of various measures depending on their enforcement. Any number above 1.0 indicates the benefits outweigh cost. benefits are calculated as rider time savings and fleet savings when buses are used more efficiently. Apparently the fines are not included in the benefits calculation. Low cost lanes with high enforcement provide the best benefit ratio. Bill 749 envisions that the enforcement cost shall be covered by the fines which must be spent to cover cost and "public safety" and that proceeds that exceed the cost by more than 10% should go into the general fund of the State. Move the Lexington Market to HarborPlace? Do protected bike-lanes really kill fire access? 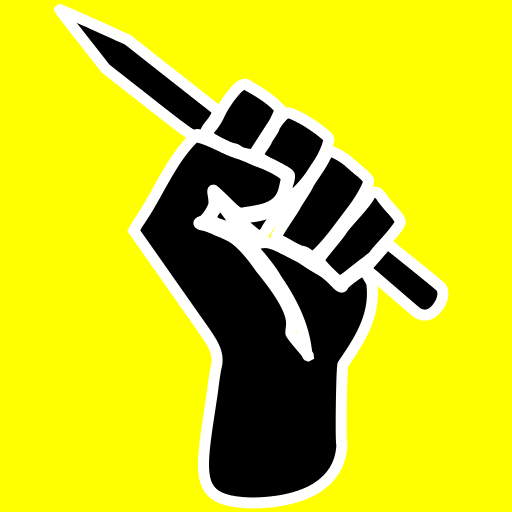 Will Baltimore get a Center for Design? What exactly was behind the Metro shut-down? Time to re-boot Maryland's transit!